The drive from Portland through Central Washington and finally into Eastern Washington made me feel like a pioneer. Perhaps it had something to do with driving across empty stretches of land where at times no other cars were in sight. Or maybe it was because every time I looked up in the stretch from Portland to the Columbia, I saw a sign marking Lewis and Clark’s trail. Whatever it was, the six-hour drive from Portland to the small industrial metropolis of Spokane, Washington led me to a gathering of writers who celebrated the West like so many pioneers before them. The promotional poster for the Get Lit Festival. 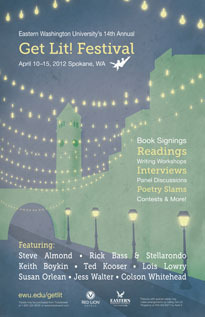 The 14th Annual Get Lit Festival (as in “get literary”) took over the city of Spokane from April 10th–15th. The festival, organized by Eastern Washington University, packed in workshops, panels on subjects ranging from writing for young people to narrative journalism, and readings from authors including Jess Walter (The Financial Lives of Poets and the forthcoming Beautiful Ruins), Colson Whitehead (Zone One), and Steve Almond (God Bless America). Publishing houses (including PSU’s own Ooligan Press) mixed with literary journal editors and bookshop owners. Everyone from writing students to literature lovers listened to panelists discuss the craft of writing or celebrated writing itself at readings and book receptions. One highlight of the festival was a combination reading and concert that brought together the talents of prolific writer Rick Bass with the melodious sounds of the band Stellarondo. An experimental partnership, Stellarondo sang original songs (accompanied by the banjo, upright bass, and the eerie sounds of the musical saw) and then played background music as Rick Bass read short stories about storms, bears, and small towns in the West. 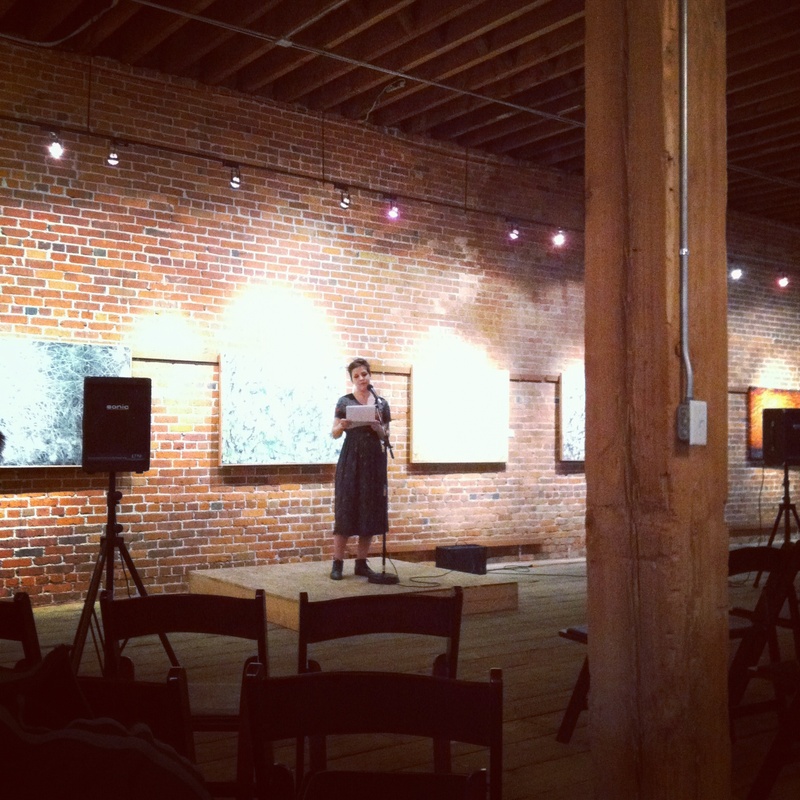 The weeklong literary celebration was capped by a regional MFA student reading that included students of Eastern Washington University, the University of Montana, and the University of Idaho. Poets, novelists, and essayists read melancholy pieces about nature, made the audience laugh over humorous memories of county fairs, and caused us to consider how place figures into our own writing. These writers were students of the West, those inspired by nature and connected to the land. Like Rick Bass, poet Richard Hugo, and novelist Tom Robbins, the writers that gathered at the Get Lit Festival proudly called the West their home. They celebrated this vast, wild country and the great inspiration it has to offer. A MFA student reads in front of a small gathering of literary enthusiasts. Driving back from the Get Lit Festival on Sunday evening, I felt pride over the West. We may not have the literary history and pedigree of New York and the East Coast. What we do have is the same wild abandon and spirit of adventure that brought so many settlers to this side of the country hundreds of years ago. We’ve reached the end of the continent and now our writers and artists—this country’s last great pioneers—are finding ways to keep exploring. If writing has taught me anything, it’s that there is always something more out there to discover. Previous Post Where Does Inspiration Come From?